Successfully Added 64GB Multi-functional USB Flashdisk - USB2.0, iOS, Android + Windows Interface, File Encryption to your Shopping Cart. Want to swap data between different devices, don't trust security on cloud services, then this all in one iOS, Android and Windows U-Stick storage is your perfect solution. Backing up data on the Cloud is never as secure as keeping a copy on your person. With secure encryption and quick USB 2.0 data rates allowing speeds of over 400Mbit/s you can quickly backup, copy and transfer all your important files between a wealth of different devices. 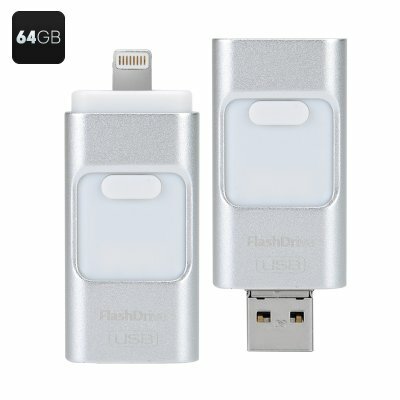 Suitable for use on Apple iOS devices including iPhone and iPads this Flashdisk is also compatible with Android devices supporting OTG and works equally as well on Windows. Now you can expand your Smartphone memory and backup data securely removing the security fears associated with centralized cloud storage. The perfect solution for sensitive data storage and an easier way to share or transfer info securely. This will also make flagship phones with limited storage more usable as you can store music, videos and photos on an easy to access memory stick, without which your Smartphone may struggle to cope with he demands of your everyday life. With this 64GB storage you will never need to be short of memory space again and its compatible with all leading Smartphone and tablets PC supporting OTG, such as Samsung Galaxy Note, iPhone, iPad, as well as compatible with desktop and laptop PCs.